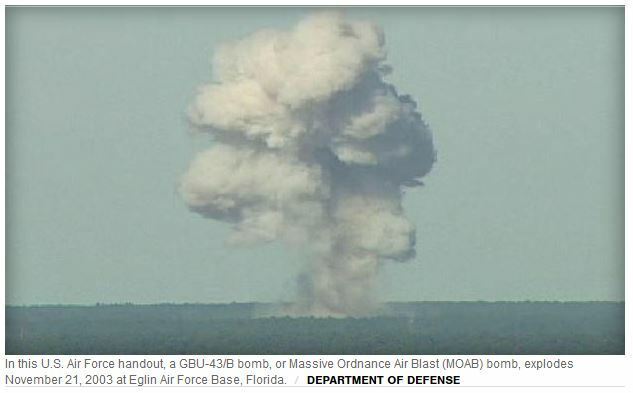 The U.S. dropped a bomb containing 11 tons of explosives on an ISIS cave complex in Afghanistan’s Nangarhar province on the border with Pakistan on Thursday, a Pentagon spokesman confirmed to CBS News’ David Martin. The site of the dropping of the “mother of all bombs” on an ISIS complex in AfghanistanCBS NewsThe bomb is officially called a GBU-43 or Massive Ordnance Air Blast (MOAB), leading to its nickname as the “mother of all bombs.” It is the largest non-nuclear bomb in the U.S. arsenal and has never before been used in combat.“The strike was designed to minimize the risk to Afghan and U.S. Forces conducting clearing operations in the area while maximizing the destruction of ISIS-K fighters and facilities,” the Pentagon said in a statement, using the term for the Islamic State’s Afghanistan branch. For this I needed to create a new category. None of the existing categories, not even Politics or Psychopathic Corporations, could cover it. I had to create WAR. Putting the human losses aside, because plenty of publications and bloggers will cover that, imagine the environmental consequences? It is nauseating – literally.